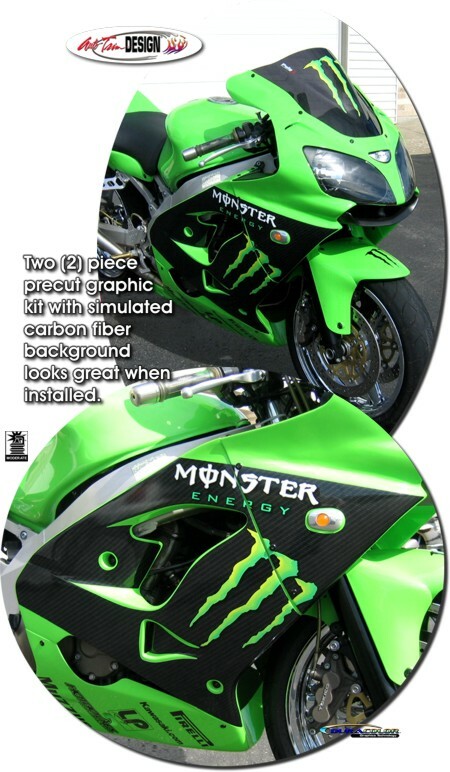 Precut to fit the '00-'03 Kawasaki Ninja ZX-9R, the graphic kit will make the bike look great! Digitally printed with our DuraCOLOR graphic technology in the colors shown (simulated carbon fiber base), kit is manufactured with premium automotive grade vinyl film materials. As a further step, graphic is covered with a 2.5 mil clear laminate which provides protection from miles of abuse. Note: Graphic kit is bike specific and will not fit any other motorcycle. Sponsor logos and Monster windshield and fender logos not included.